Tonight from 7PM to 9PM on WRIR I will explore the musical family tree that is NIRVANA. I am quite certain there will at least something for the experts on the group to those of you who still insist that Mudhoney were better. 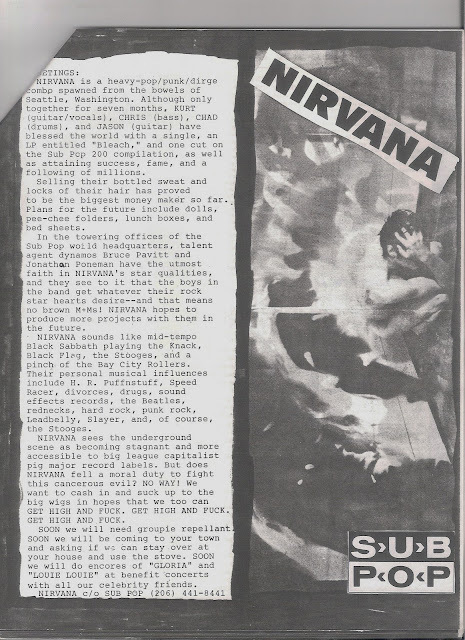 I moved to Seattle in early 1994 at the age of 23 (right before Kurt's suicide) to work at record label called C/Z Records but I obsessively followed all things Seattle starting in the late '80s. Because of this early passion for grunge, my private collection of early Sub Pop material (both printed matter and music) is rather extensive and in turn my knowledge of this scene comes from first hand experiences. Rather accidentally I lucked into a part time job cleaning an artist's studio at the top of a lovely lakeside house that was a few doors down from where Kurt and Courtney lived. The side window overlooked a part of the Cobain property that offered a birds eye view of part of the building we all later learned in the press was where Kurt died. If there was terrible time to move to a city you spent half a decade worshipping, this was it. I grieved with the world as kid from NJ who grew up loving the music of NIRVANA and I certainly never expected life to lead me literally to death's door. I think my story in many ways isn't exceptional. There were a lot of us who were around the same age as the members of NIRVANA and felt a deep connection with their songs, music that was rebellious, at times angry, and had lyrics that were ambiguous enough to make them your own. We all sort of grew up together and whether you knew the group or not, the death of Kurt represented not only the end of a band we loved, but our wild, troubled youth as well. Tonight will not only be a nice excuse to visit some music that I know changed my life but maybe a few of yours too. I can't legally read on air some of what the opening page of NIRVANA's press kit for Bleach says but I have posted it here for all to enjoy. I think this gives you a pretty good hint of what to expect from my show tonight. UPDATE: The final tracklisting can be found here. UPDATE 2: Download the whole show here.